If I switch from an author to a publisher, do I need to re-upload my books to Amazon? If I publish a book on KDP Print AND IngramSpark, do I need separate ISBNs? What practical steps do published British authors take do to adapt their book covers for the United States? What free software do you recommend for formatting IngramSpark-ready PDFs? How can I clear a pen name for use? How can I clear a publishing company name for use? 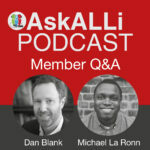 Michael: Hello and welcome to the AskALLi Member Q & A podcast, the podcast where we answer your most burning self publishing questions. I’m your host Michael La Ronn and I am joined by Dan Blank from WeGrow Media. How are you, Dan? Michael: Yes. So, we are in December. It is the last podcast of the year, last podcast before Christmas, last podcast before New Years. Can you believe that? Dan: I can, we’ve done a lot of these. These have been really fun. It’s been fun to watch it evolved too and I’ve been in 2019 planning mode for so long now sometimes I’m sort of like, “Wait, what year is it? Michael: Yeah, where am I again? 1984? 2018? I don’t remember. Michael: Yeah, we we’ve actually known each other for almost a year. So I was looking back through our archives in our first podcast episode together went live on February 8th. Dan: Young Michael and Dan. Michael: Alright, so the theme for this episode since we talked about doing a year together and having been doing this since February, you know, we’ve actually been keeping track of all of not only the questions but just kind of our own progress and some of the things that we’ve been talking about on the episodes and so I thought we would start this month’s episode by talking about the top 3 things that each of us have learned as writers this year, right, because the whole point of this podcast is to answer those questions and make everyone feel or answer the most burning questions so that you feel like you can be comfortable in your writing business, right, and so what are some of those top three things that that Dan and I have learned ourselves that maybe might help some of you on the show but then also we’re going to talk about the top or top couple, maybe top five most commonly asked questions on the podcast this year and so we’re going to talk about trends and we’re going to talk about the questions that seem like they keep coming up and we’re going to answer those again so that, you know, because we know they’re going to probably come up again in 2019 so. Michael: You want to start, Dan, on the top 3 things you learned this year? Dan: Alright, and we can go back and forth. Yes, so the first on my list and it’s funny because I think all three of mine go back to the basics. I grew up as an artist and a writer and that’s been the consistent thing throughout my life. I can pick an age and tell you what crazy writing or art project I had and even though I’m like four and a half decades into this, this year one of the big things was the value of daily practice. So for writing, I’ve talked about that for myself of like a writing practice but even for me where I had dabbled in playing guitar for 20-25 years and this past year, literally a year ago December 18th, I started a daily practice of how to properly learn how to play guitar and I tracked this, I’m writing a whole analysis of this and it was an incredible reminder of the value of daily and I will tell you that for me some of those days I had to log in one minute of practice and even though that is pathetic what happened is that I never once had that feeling that most of us have with our writing or our business or our marketing of “Ugh. It’s been 19 days since I’ve written, maybe I’m too busy to do it” all that doubt never crept in because I could look at the calendar and I’d log it where I had practiced every day and looking back on a year of it, it is very familiar it for me to have a guitar in my hand. I’m still horrible. I still have all these issues and we’ll get to how I’m dealing with that in one of my next lessons but that daily thing, it really changes you in a way because you no longer question your identity around this, you know, am I a writer or is it too late for me? Am I writing the wrong thing? It doesn’t matter, you’re a writer and I’ve even done that with reading where I have a daily reading practice and I attach that to lunch so when I’m eating food in my studio, there’s no devices, it is a book and I have read so much more in the last year than I have in previous years because I had that daily practice where if there’s food in front of me, there’s a book in front of me, so daily practice is my first big lesson this year. Michael: That’s great. Yeah, I remember when I played the guitar and the saxophone and there’s just something that musicians understand the idea of practice, right, that’s so difficult for writers to understand that you can’t get better unless you write every day, so that’s that’s awesome and as a former musician, that’s awesome. Dan: We’re going to change that in 2019. Michael: Former musician. Well here’s the problem, when I started writing I was also writing music and they were competing so much that I had to say “OK, I guess have to, got to ditch the music, I sold all my instruments so that I could be a writer believe it or not. Dan: Killing me. Alright, what’s your first lesson of the year? Michael: Alright, my first lesson of the year is I learned how to make better videos which ultimately taught me how to iterate a product and how to listen to reader feedback and listen to things that people are saying in the market. So, I relaunched Author Level Up, my YouTube channel in June of this year and if I look back on those first videos that I did just this past June, I upgraded my camera, did all these really cool things with my office and the videos look terrible. They look terrible compared to the ones that came before it three years or a year and a half ago and so I got feedback from people that were watching my videos and I, with every video that I recorded, I changed one thing. I tried to fix one problem. That’s the only thing I focused on and so if you look at my first video in June and then you look at my last video it’s like night and day and so I just change one thing per video every single week and it’s amazing how much better my videos look now and I have an editor and like, all the sorts of things, like, because I focused on changing things and videos were more successful and brought in more people and so now I’m in a position where I can do that and so I think people listening to this, just think about how can you, you know, if you take Dan’s advice on practicing, how can you focus on getting better in every practice session? Is there one thing you can learn every day that will make you better? Michael: Exactly. Alright, what’s your number two, Dan? Dan: Alright, number two is invest in collaborators and I think this is something that writers have a really big problem with. Often because we have the romantic vision of “I work alone in my basement and this pure, beautiful, amazing vision boils inside me. I can’t not write” and it’s so personal and then we say “Well, I’m an introvert so I really can’t talk to other human beings.” These, like, really untrue excuses and what I find with the writers I work with with my own practice is that if you’re serious about this, you will have a collaborator of some sort. It doesn’t mean that they have to be collaborating on exactly the words you’re writing but you’re going to have editors, you’re going to have moral support, you’re going to have practical advice. Even this podcast is a collaboration because I learn from you, even hearing what you say about choosing between music and writing and selling instruments, I’m going to be thinking about that. I’ve interviewed you for my podcast and this is something I see all the time so I run a mastermind group, it’s a big part of what I do so it’s always this idea of a group of 10 writers coming together and what is created together that can’t be created alone and I think a lot of people I talk to whenever you get into the challenge of writers, whether it’s writing or publishing or marketing the overarching problem is that they are overwhelmed, they are alone and they’re struggling and they’re second guessing everything and it creates a real unpleasant place by which to work. And just to follow up on the first thing around the guitar, for year 2 of playing guitar every day, one thing I’ve looked at is saying “Well, where are my, where are my problems? And my problems are, I have all these disparate skills now that don’t feel collected and I get in a rut of how uncomfortable practicing, so for year 2 I have hired a guitar teacher and my goal, I was really clear with them about, you know, this is my problems and this is where I want to get to and it’s neat too because I hired someone, now I live in New Jersey, so the most convenient guitar teacher I could find lives in New Zealand. Michael: Whoa. Out of all the people in New Jersey. Dan: And this is someone I’ve watched on YouTube for a while, they offer online instruction and even that gets around a lot of challenges where, look, I’ve got a young family and I run a company, it’s hard for me to make room to drive over to music school, to wait in the chair until the instructor is ready to sit in the room, to then drive home, where if I’m doing Skype, a one hour session is literally one hour start to finish, there’s no dead time, there’s no rescheduling, there’s no wasted effort, there’s no snow, there’s no rain, so this idea of investing in collaborators is how I’m taking my practice to the next level. Dan: Wait, you’re just never going to say the numbers without me just with my jaw on the floor and wanting to compliment you on how much you write, sorry, go on. Michael: So I thought that, OK, I, compared to book one, compared to forty, I was like “OK, oh, I probably learned something here that people want to keep reading and that didn’t really happen and I ultimately think it was because of the packaging and it was because of the story was so far off of the market in terms of what readers wanted that I just, I kind of swung and I missed and so I kind of had to pick myself back up and so I’m writing a new urban fantasy series now that I think is going to be much more dialed into that sweet spot and so we’ll see in 2019 if I learned from my mistakes, so that’s the second thing I learned. Dan: I just want to reflect on that, I think it’s such a great reminder that even 40 books in you don’t know what happens but you know that there’s a process by which to kind of keep trying and I think that’s a huge lesson for people. Dan: Alright, so my third is, and this is something, it’s like anything, I’ve known these but I’m just reinvesting in them, the value of one on one outreach and this is something I’m talking a lot about and focusing a lot on. We talk a lot about marketing and “Oh do you do ads and newsletter lists and courses and going viral on social media and what I find is really feels good and actually works is connecting to one person and again, it’s the example here of this podcast because I mentioned Michel to a lot of people now because we have this collaboration and I’ve interviewed you and I’m more aware of your work and because I’ve really dug in with the interview and even here, it’s like, it’s this one connection that will have, you know, a 1000 different ideas come from it and I think that if you’re a writer and you’re really freaked out about author platform and about book launches, about marketing really whittling it down to like “Well, let me talk to one bookseller and just ask this question. Let me talk to one other writer that’s kind of in my genre and ask that question. Let me talk to one reader and figure something out” and I think that it boils it down to something that’s very human, very actionable and can’t freak you out and I find that you learn a lot. I remember when I used to work in corporate, I’d do all this usability testing for websites and what I would find is that even if the website was going to serve thousands of people, like it was a real app, if I really took 5 people through it I would learn 80 percent of what I needed to know about what worked and what didn’t work in 5 people, even though it was going to go to tens of thousands of people and I think that applies here that if you’re not sure how to develop a collaborator, how to reach out for publishing, how to think about marketing to readers, how to think about genre where people are, talk to one person and then talk to another person and focus on the very deep, very human level of collaborating. Michael: Yes, I love that. Baby steps, right, because as writers, we’re introverts and it’s sometimes hard for us to break out of our shells and I know I struggle with that too, so, alright. Michael: My third is, I’ll keep it simple, is just how to get creative with affiliate income. So, affiliate income is super powerful, it is incredible but for authors, you know, we often just think about, you know, Amazon affiliate income, right, but there are so many different types of affiliate income out there. So this past year on my YouTube channel I did a video series on how to use Scrivener, the writing app Scrivener and those videos have been wildly popular and one of the things that I’ve done is I’ve included links to an affiliate program through Scrivener and also through Learn Scrivener Fast by Joseph Michael and I found that people are clicking through to those because they found the videos helpful and they want to learn at the next level and so I think that’s been hugely successful for me this year. Michael: Alright, so let us jump in to some of the most common questions that were asked this year. We’ll do three or four of these and then we’ll jump into this month’s questions so a question that came up quite a bit this year was “When do I need to use different ISBNs for my book?” We get this question once a month. It just keeps coming up, so the general rule for this is to use one ISBN per format of your book so if you have an e-book you would want to use one ISBN for that, one ISBN for your paperback, one ISBN for your hardcover, basically every edition you would want to use a different ISBN. And then, “How can I connect with other authors in my genre?” Another great question and that comes up quite a bit, so Dan and I talked about that, so you know, start with people that you know. Don’t be afraid to email someone or Facebook them or you know, just figure out who they are I think is the first thing and then just don’t be afraid to just reach out and just ask them how they’re doing and just ask them about their work, read their work. Dan: Yeah, that feels basic. It’s funny too, like, I run a podcast and I email them and I interview them and it becomes a great excuse to ask them questions on a professional level that I can never ask them on a personal level. Dan: Because now you’re an interviewer and you have another reason to reach out that doesn’t feel like you’re needy, I would say. Dan: But now you’ve made them worried because you brought it up. Dan: No, I know, I was actually reading some articles about, you know, people doing stalking and stuff and how easy it is for them to be able to reverse engineer a pen name or a domain name to find out who you are, so one of the great questions we got this year was “Can you keep a pen name truly secret?” and I think the answer is no. I think the answer is no, because ultimately, you know, your ebook retailers are going to be able to figure out, you’re going to have to give your information to them for them to pay you and then also it’s super easy in today’s digital age, even if you try to remain completely private for someone to find out who you are so, you know, can you remain secret for 85 to 90 percent of the population? Yeah. But you know, if somebody really wants to find you they probably could. Michael: Alright, so another great question that we had this year was what are some good low cost, low time consuming strategies, alright, I may repeat that. Another great question we had this year was “What are some good low cost, low time marketing strategies for authors” and we definitely encourage you to check out our June episode because that was, our June episode that went live, I believe, around the 3rd week of June and Dan and I kind of tag teamed that and the big takeaway for us was that marketing doesn’t have to be expensive. It doesn’t have to be this huge, monumental hurdle that you have to jump over, you know, I always like to think about it as, you know, one bite at a time, you know, one step at a time and so we had a lot of great strategies in that episode that was probably one of our better episodes this year so be sure to check that one out. And we will finish up with this with another copyright question because we got this quite a bit this year is “How do I go about getting permission to use a song from a famous artist?” So a lot of people like to use epigraphs in their work so how would you go about doing that? First thing is get permission. That’s the most important piece and then the second thing you can do is, you know, figure out if there’s some way you can email the record label or the artist to request permission and that would be a great answer to that question. So those are kind of some of the trends in terms of questions we saw this year, anything you want to add, Dan? Dan: No, I think that’s a good recap. Michael: Alright, so let’s jump into this month’s questions, why don’t we? Dan: We need the sad trombone sound for some of these answers. Womp womp. Michael: Womp womp. And the reason for that is because when you have an author account, you have an author account. When you have a publisher account, there’s going to be a different account right so I believe there is a process in which you can keep the reviews of the book, I’ve heard that some people are able to do that but yeah, you would need to re=upload the book if you wanted to if you were truly switching to a publisher. If you were just switching, like, if you were a sole proprietor or sole trader and you were just switching to an L.L.C. then no, I don’t, you would not need to create a new account. You would not need to re-upload your book but if you’re truly, if you’re an author and you’re truly going out and starting a publishing company then yeah, I think you probably would need to re-upload your stuff. Michael: Alright, there’s the ISBN question. So the answer is, so presuming that you’re uploading a paperback, the same paperback to KDP print and IngramSpark the answer would be “No” because it would be the same edition of the book, so you could use the ISBN that you have for KDP Print and then you would also just use that same ISBN for ingramspark. Michael: That’s a great question and one I don’t know that I’ve thought about a whole lot, you know, because you think about the classic example, I always think about is like, the Harry Potter covers, like they’re different in the U.K. than they are in the US but I don’t know of any self-publish examples where the book cover was different in another country, like where the book cover was different in the U.K. versus the U.S. Maybe there are some examples out there with crime and stuff, like I know putting guns on covers and stuff is not always doesn’t always fly in every country but in the U.S. we love guns on our cover, so you know, it just kind of is what it is. Probably what I would do, because if I did know the answer this question what I would do is I would probably talk to other authors in your genre and I would probably talk to readers in your genre and you might even do just a quick survey. And then just show them the cover and say if you were a reader of this genre would you buy it and why and just see what they say because maybe you don’t need to change it, maybe there’s nothing you need to change or maybe there is something but that’s probably how it would start is I would survey other writers in the genre in the U.S. or in the U.K. and then I would survey some U.K. and U.S. readers just to see what they think but you know, it may be less of an issue than you think depending on your genre. Dan: Alright, next question is from Andrew “What free software do you recommend for formatting Ingramspark ready P.D.F.s? Michael: Alright, so that is a great question. I would recommend reaching out to Ingram. I know that, because the spirit of this question was if you’re uploading to P.D.F. Ingram requires, there’s different types of P.D.F. so the standard P.D.F. that we all use that we get, you know, when we we export something from Word that’s your basic type of P.D.F. but I think they require P.D.F. X./1A which is a specific type of format. I’m not aware of any free software that will allow you to generate that but I don’t know if Ingrams requirements, you know, if maybe they would maybe accept a standard P.D.F. format so what you could do is I would reach out to Ingram and ask them. Another thing that you could do is, you know, a book formatter would be able to help you but that wouldn’t be free, so probably your best bet would be to just try to upload something and then if it doesn’t work you could probably work with Ingram or their customer service to figure out the best way to make sure that the file is optimized for their platform. Michael: I love this question because I just did it. I literally just did this exact same thing this week, so when you’re thinking about pen name I think there’s a couple things you want to make sure that you’re not doing. The 1st thing is you want to make sure that no one else has the pen name in your genre so if I want the name Michael Laronn and there’s another fantasy or science writer named Michael Laronn probably a bad idea. Yeah that’s probably a bad idea but if your name is like, let’s say your name is like John Evans and that’s a common name, right, or John Smith and you write post-apocalyptic novels and there’s a John Smith that writes romance novels I think there’s probably very little overlap there, like there’s not going to be any reader confusion if it’s a romance reader buys a book by John Smith and then a post-apocalyptic reader buys a book by John Smith. I think there’s enough separation there where you would be OK. But the key is you don’t want to step on another author’s toes, right, because you don’t want to have a pen name and then have someone else come down the road 5, 6, 7 years later with the same pen name and then also you could potentially get yourself into some intellectual property issues, unfair competition and things like that you don’t want to mess with that so that would be the first thing I would make sure that I would check and then the next thing is just make sure that for whatever reason and most of the time you’re not going to run into this issue but just make sure that the name isn’t trademarked, like the name that you want. So like in the United States, the United States Patent and Trademark Office has a database where you can search, it’s called TESS, T-E-S-S and you can search for names of trademarks and it’s not guaranteed, it’s not the end all be all but you maybe just want to search and make sure there’s not a name of like a fashion designer, or you know industries that tend to where people start companies that, you know, where their names are the company. You maybe just want to make sure that that’s not something that’s trademarked. But even if it’s trademarked in the United States it could be trademarked in the U.K. and you would never know so but it’s usually just an added layer of protection in whatever country you live in to maybe just check, do a trademark search and just make sure that that’s not trademarked either but that would be the way that I would do it. If I were going to clear a publishing company name for use, I would also check the marketplace, just do a quick Google search for whatever company name you want. Just make sure there’s no other companies out there that are in your market that are doing the same thing you’re doing. Generally if, you know, you’ve got something, you know, we’re not attorneys and we don’t provide legal advice but generally if you’re in different industries then you’re probably be OK if you have a name that’s the same or similar. It’s just if you’re competing with someone else, you could potentially get yourself into trouble with an unfair competition and then what I would also do is just check the Secretary of State in your state if you live in the states or probably a similar office, public office in the country you live in just to see if there’s another business that’s registered under that name. If it’s not then, you know, you would be within your rights to preserve that name in your state and generally other states are going to recognize that as well. Dan: Alright, that’s what we got for this week. Michael: Alright, so those are the questions we’re ending 2018 strong. We’re going to be back in 2019 and I don’t know we’ll probably do, it seems like goals is always a good topic in January maybe we’ll do something on our writing goals and what Dan and I are both planning on doing for the year of 2019 so this has been the AskALLi Member Q & A podcast. We want to thank you for listening this month. Don’t forget that you can submit your question via our member Q & A form that is on your ALLi dashboard if you’re a member. It’s also in our Facebook group. I post that monthly in our Facebook group if you want to click and submit your question. So, with that, thank you for listening and we’ll talk to you next month.